Developing fluid handling components that meet our customers’ defined performance requirements has been a priority since Pneumadyne’s inception, setting us apart in the miniature pneumatics industry. As equipment becomes smaller and more compact, manufacturers turn to Pneumadyne for products that will fit their machine while providing the function they need. 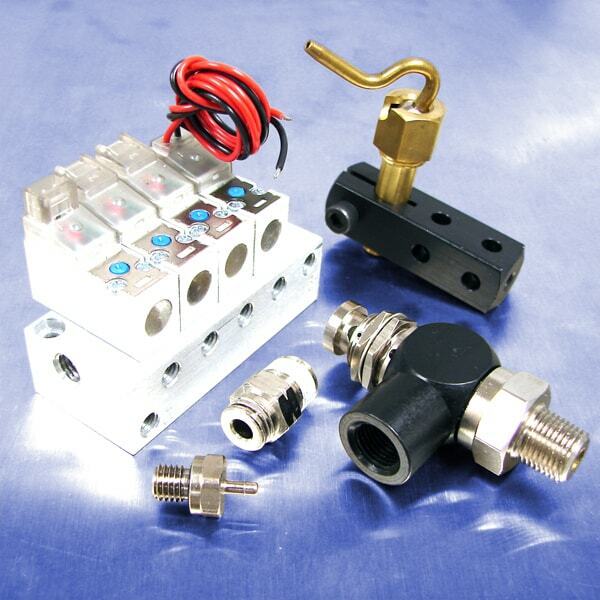 By consolidating components into a single valve block or manifold system, not only are we are able to reduce the size of the circuit but also ease product assembly, saving our customers time and money. Potential leak points are also eliminated through a new, more efficient design. To discuss the pneumatic products needed for your automation equipment, contact our engineers today. Pneumadyne directional control valves, pneumatic manifolds and miniature pneumatic fittings are ideal for use in a variety of automation applications. Our 2-way, 3-way and 4-way control valves feature a variety of configurations, sizes and porting options to fit the plumbing requirements in your pneumatic control system. Threaded, barbed and push-to-connect fittings are available in numerous sizes and configurations to connect the components throughout the system. Pneumadyne offers solenoid valves with a variety of flow rate, connector and voltage options to convert electrical signals into pneumatic functions. Air nozzles are ideal for blowing unwanted dust and debris from specific location within a machine. Just a few of our standard components are featured below. However, our full product offering can be accessed through by clicking on the top navigation (in the gray bar).